The average Spredfast customer has authenticated accounts with over 7,000 LinkedIn connections in aggregate "“ some with as many as 70,000 connections. Until now, company updates have gone to all connections. Specific segment targeting was not possible for updates going to the LinkedIn Today news feed LinkedIn's new Targeted Status Updates completely change that "“ and redefine the way businesses can interact with their audiences on LinkedIn. Using targetable attributes like Company size, Industry, Function, Seniority, and Geography, businesses will be able to interact with their Followers in a more meaningful way. By ensuring that the right audiences see the right updates, LinkedIn"™s new targeting capabilities present opportunities for every business. Like any marketing program, improved targeting yields higher response rates, engagement, and conversation. One of our customers, a global hardware and software company, is already developing a plan to leverage the upcoming functionality through Spredfast. They will be able to market a product launch to people at companies with over 5,001 employees in the High Tech industry. They will also be able to publish a recruiting update targeted to Project Managers at the Director Level that live in Delhi or Mumbai, India. 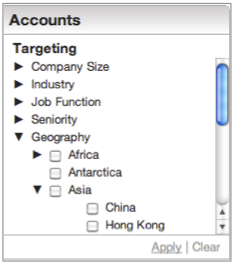 Clarify Business Objectives: There are five targeting categories that have multiple subsets. Businesses must plan how they will execute all of their LinkedIn social objectives in a coordinated and measureable way. Virtually all of our customers have multiple teams and departments that touch social, so they divide their businesses up into multiple initiatives. This allows teams to plan, engage, measure, and compare independent initiatives while staying coordinated with other parts of the business. Drive Engagement with Content: Improved targeting means brands must rethink their engagement strategy on LinkedIn. Unlike Facebook and Twitter, LinkedIn is a business network where people connect with their employers, their colleagues, companies they aspire to work for, and influencers. The bar for content is high: an update must be relevant and timely for Followers to share it with their professional networks. Our customers who publish LinkedIn-specific content grow their networks and rates of engagement more quickly than those who simply publish their Facebook posts to LinkedIn. With this newly segmented social audience, relevant content will continue to be the most inexpensive and organic way to expand a network over time. Demystify your Audience: Insight into social audience demographics is always a top priority for our customers. Aggregated metrics allow them to break down and compare performance across audiences and fine-tune engagement strategies over time. It will be critical for businesses to have a single place where they can analyze historical trends and shifts in their audience to get the most out of LinkedIn targeting. Targeted Status Updates introduce both new opportunities and new challenges for brands. In order to prepare for the new world of LinkedIn, companies must start thinking about focused LinkedIn engagement strategies. This ongoing evolution of social networks means that coordination among teams, planning content, engaging different audiences, and comparing results are no longer concepts limited to Facebook and Twitter. The world of content marketing on LinkedIn just got a lot more sophisticated. The brands that can organize and focus in order to create the most relevant content will rise to the top. We"™ve been working closely with LinkedIn to create Targeted Status Updates functionality within Spredfast. We are happy to announce that this new functionality will be available in Beta on August 31st to limited customers. Stay tuned for more details on how Spredfast will transform your presence on LinkedIn.